For those of you who have upgraded to a 406 ELT did you mount the antenna in the original location? I will soon be installing a 406 Elt. I could never understand why an elt antenna would be installed on the bottom of a fuselage, I know of no other aircraft that does this and I believe it's not a recommended position. I intend to mount the antenna inside the fuselage since it's carbon fibre with a 14" round ground plane as recommended by the manufacturer ( ACK ) as an optional install method. This is why I went ELSA. I will guess you will have to mount it in the original place for SLSA so that it is destroyed in an accident, unless of couse if you land inverted. The ones I have seen done did put them in the same place. I know of a CT that has the ELT antenna mounted inside the cargo bay. It works fine. Well there are 2 schools of thought on antenna location between fuselage top or belly. 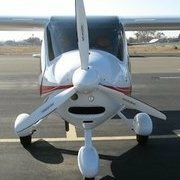 My thought is if I really need the ELT there is a fair chance the airplane will be on its back and the antenna will be pointed up. My issue is installing the antenna in the original position as called out in the MRA allows the antenna to hit the ground on landing. To prevent this from happening I could bend the antenna slightly, but the manufacturer says not to do this. I agree with your thoughts on placement. If BRS is used, I plan on manually activating the ELT during descent. If for some reason the airplane overturns, the antenna is then pointed towards the sky. My replacement ELT is an Artex ELT 345. It is an excellent unit and reasonably priced. It is the standard ELT Phil Lockwood ships on all his AirCam's, worldwide. That's good enough for me. LOA from Flight Design was issued for the install. The antenna is a wire-whip type and pretty long. It is mounted on the bottom aft fuselage, same place where the old one was. It does stick down quite a bit, but not so low that it scrapes the ground, during landings, even in a high pitch attitude. However, when I am ground handling the airplane and lower the tail to an extreme, the antenna WILL make contact with the ground. Such an extreme lowering is not necessary, as it also threatens contact with the lower aft tail fairing. The end of the antenna has a rubber tip on it. After landings, with a high touchdown pitch attitude, I have inspected the rubber trip for scrapes and found non so far. I think this may be another of those differences between a CTLS and CTSW. The airplane I am retrofitting is a CTLS. I happen to also have a CTSW in the shop, and a quick measure shows that it would have about 1" more clearance. With the antenna mounted the nosewheel can only be raised 3" before the antenna touches the ground. That is not even half way to the ground with the tail. The antenna for this installation is a RAMI AV-200(-B).
. . . I think this may be another of those differences between a CTLS and CTSW. The airplane I am retrofitting is a CTLS. I happen to also have a CTSW in the shop, and a quick measure shows that it would have about 1" more clearance. With the antenna mounted the nosewheel can only be raised 3" before the antenna touches the ground. That is not even half way to the ground with the tail. The antenna for this installation is a RAMI AV-200(-B). Okay . . . difference noted! Correct this if I am wrong, but on a new CTLS, isn't the ELT antenna mounted on top, just aft of the VHF antenna? I seem to recall, there was a photo of that. Care to share with us on that? 406 ELT antenna MUST be installed within 30° of vertical relative to level flight attitude. 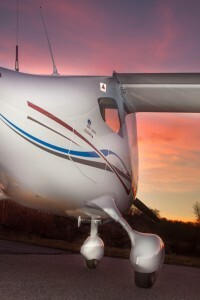 Advanced Aircraft Electronics Inc. has dipole antennas that do not need a ground plane, and have awsome performance. I have one in my cub for the com and the performance is far better than your typical aircraft antenna. I have not tried the ELT antenna yet. These antenna's however are designed to be installed inside composite or fabric aircraft but use very simple install methods. I think they are designed for non conductive composite structures. I believe our carbon fiber structures are conductive. All carbon fiber is partially conductive due to the graphite in the material. Some have metal mesh impregnated into it but not in the CT. I have no problem recieving gps signals thru carbon fiber at least inside the instrument panel. The same applies to fabric which has many coatings of sprayed aluminum flakes for uv barrier. I will try an antenna in the rear fuselage tomorrow to se if it works as the carbon fiber is thicker there. The purpose of a ground plane is to reflect radiated signals, and comprises the other half of a monopole antenna which is needed to set up the magnetic field. It has a SIGNIFICANT affect on the gain of a monopole. Dipoles do not use ground planes in most cases. A ground plane with a dipole antenna will significanty degrade the signal gain. I believe the carbon fiber composite will act as a faraday cage and greatly reduce the ELT signal propagation if the ELT antenna is placed inside the fuselage. You are correct that some carbon composites have a metal mesh impregnated into them and that ours does not, but the intent there is lightening protection. The carbon fibers can't carry as high a current as copper, but I don't think they need to to effectively attenuate your transmissions. 1) There is a big hole in the carbon fiber structure for the windscreen, which lets radiation into the cockpit. Not so much for an antenna placed behind the rear cabin bulkhead, which is also carbon fiber. Yes, there are a couple holes in the bulkhead too, but they are mostly blocked by carbon-fiber seats - not much help there. 2) I believe it's a lot easier to get reasonable reception with a partially shielded antenna than it is to transmit with it. Receiving is all about signal-to-noise ratio. Transmission is about pumping out power. 3) Modern GPS receivers are adept at using very weak signals. We are able to use them in are cars (which also have holes in the faraday cage) and houses. Part of this is that they are digital which allows them to use algorithms to fill in missing bits of data. The 406 MHz portion of the ELT signal is digital too, but not the 121.5 MHz portion. Still, I think you would get much better GPS reception, and at least quicker initial fixes, if you use a remote GPS antenna placed on top of the glare shield (which is also carbon fiber) rather than under it. The disclaimer here is that I do not have a degree in antenna design… but I know someone who does (my brother) so if any of this sounds intolerable wrong or in need of further clarification, I’ll forward the issues to him. As the ELT manufacturers recommend, the best place for the antenna is on top of the fuselage. In the scenario you describe, activating the unit while coming down under chute, you need the signal to be propagate upward. If it does the MEOSAR Satellites will instantaneous detect you 406 MHZ signal and establish your location, even without the GPS output data (which further refines the location). They will know where you are and that you intend to crash before you ever reach the ground. Not so much if the antenna is underneath the plane. Also, though many of our off-field landings and runway excursions end with the aircraft flipped on its back, these seldom result in serious injury. I think you will be more in need of rescue after a steeper angle impact, such a stall-spin accident, where I think the plane is more likely to end up with its top side more or less up. Having said this, I must also admit that I recently installed a 406 MHz ELT myself and have not yet gotten around to relocating the antenna. However, it is on my seemingly infinite list of things to do, all of which I would like to finish before I crash. You are correct. Further research into this shows that signals will work in carbon fiber but at very reduced performance. Putting the ELT antenna on top for most aircraft is close to the tail which helps protect it in a turnover . This is not optimal in a ct due to access and reduced size at that position. One good thing, I talked to an ACK engineer and was told that even if their antenna is severely damaged that the signal on their 406 ELT is so strong the satillite will pick it up. He told me in a fabric aircraft even without the antenna the satillite will most likely receive the signal. Today I checked where my gps and xm antenna's are and they are well under the carbon fiber panel/glareshield, the only holes are the small defrost vents. I then removed my Garmin Aera 660 from my cub and placed it about 3 ft aft of the rear baggage bulkhead and turned it on as it has an integral antenna in it. I then closed up the ct and waited about 10 min. I then opened the baggage door and checked the satillite status and found it to have strong signals on all. I removed it from the ct and let it stabilize outside for 10 min, there was no change. The carbon fiber did not impede the signal. Next I will use a portable vhf test antenna and ground plane in the fuselage and with a signal strength meter to see if the carbon fiber degrades the rf strength in the 120 to 130 mhz range. You however are right that the general consensus is that carbon fiber is not acceptable for rf passthru. I do remember reading a tech article that electrical conductivity can be manipulated by the manufacturing process and materials used but this is beyond my knowlege of carbon fiber characteristics. When I went to school for aeronautical engineering, carbon fiber was not even mentioned, probably only NASA and the military were playing with it. As for 121.5 , it is worthless. A man with no medical, had not flown in years, had a habit of leaving for weeks without leaving word took off at night in a c150 at MKS. There was an elt 121.5 signal for at least 5 days and it was reported with no action. Several weeks later the plane was found and the pilot had survived long enough to crawl a distance before dying. The plane crashed just off the end of the runway in the woods. 406 is the only way. Much later I reported an elt signal at JZI to Charleston TRACON while installing a 406 in a man's plane. 6 days later it was still on with no action. I finally found the plane tied down on the ramp. This is a great website for info and I appreciate your input. 1) The instruments in the panel are not really in a cage. The signal is probably coming in from under the panel. 2) Testing the GPS receiver in the fuselage is a neat idea. You might need to roll the plane around a bit though, to make sure it is really tracking and not just accepting the last known position as good enough. 3) Putting a transmitter in the fuselage is a really great idea (again, transmission is much more challenging than recieving). 4) I would also be interested in hearing what you learn from the ELT manufacturer. 5) Yes, 121.5 is no longer used at all as an indication of an emergency. The FAA has made this very clear for years. But it is still used by the search and rescue folks to pinpoint your location as they close in on you. This may be significant if you don’t have the GPS interface to the 406 MHz signal - which is a more effect pinpointing system. 6) A more touching story than that of the MKS man you mention is that of young Carla Corbus who survived 54 days after a plane crash in mountains of Northern California. She kept a diary detailing the eventual deaths of her father and mother and her anguish and anger that no one had come to rescue her. Her remains were found by a hunter 6 months later. Her story, widely published in 1967, resulted in the FAA mandate for ELTs. Talked to ACK engineer yesterday. He told me that if rf passthu test is acceptable he would not have a big issue with putting the antenna in the fuselage, however it would not comply with the regs. He said if it was his personal plane this is what he would want based on his involvment in many NTSB investigations. Now this is only his personal opinion and is not advising others to do it, and he is not representing ACK in this. He said that the regs require that the antenna be mounted on top of the fuselage and that being LSA or experimental does not allow deviation from this, bottom mounting is not recommended however he doubts anyone will notice. I guess I will have to decide what to do when I install a 406, if I use outside mounting it will be on top. Good conversation and great plane. I think there can be a lot of improvements which I will make. I seem to have a tendency to do this on a lot of certified planes over the last 40 yrs, some of my FAA contacts are amused over this. I think a Stuttgard 100hp turboprop would be interesting ?, I said that to my wife the other day but got that evil eye look. I think a Stuttgard 100hp turboprop would be interesting ?, I said that to my wife the other day but got that evil eye look. I know your joking, but that would make certification difficult. ELSA knows no bounds. A lot of people think I joke about a lot of things. My father thought I was joking when I said I was going to build a plane in my room in college (he was not happy about that), I flew it home after graduation. Cost is my only barrier. Some think "madhatter" suits me, and sometimes it might but it has been the name of my hat buisiness for over 30 yrs. The real Madhatter has been on Xanax since the book came out. Over many years a lot of people only know me as madhatter and not my name. There were many times CHS atc controllers would say madhatter on initial contact. Actually it does. For an airplane to be LSA it requires a single reciprocating engine. No mad scientist turbine engines allowed.